On the banner at the top of this page I warned the readers that, from time to time, the content of this blog will go off on a tangent. This entry is one of those times. If you're looking for political observations today, just click your cursor and move on. Father's Day is a tough holiday for me. My own father, Robert J. West, died more than 27 years ago, two years after he retired from a career in which he worked sixty plus hours a week for more than thirty years to make a good life for his family. My father was an uncomplicated man. One of five siblings being raised by a single mother - his own father passed away at a very young age - he left school early to help support the family. With only an eighth grade education, his options were limited. He even spent some time with a circus, but ended up working as a floor covering installer - carpet and vinyl tile. 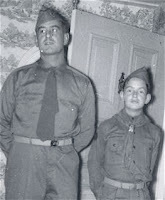 Ineligible for military service in World War II because of a childhood knee injury, he worked two full time jobs for the duration of the war - one as a carpet installer and one as a defense plant worker. At the end of the war my father joined thousands of others in a migration from the mid-west to California, to find a job where he could work without the possibility of freezing to death in his truck, as almost happened in the winter of 1945 in Ohio. He began his own carpet installation business and found a modest home to buy before sending for his family. From that time, in 1946, until he retired in 1977, he worked twelve hours a day, five days a week, plus a half day on Saturday, to make a good life for us. I learned much from my father. Following his example, I learned to treat everyone fairly a nd honestly. You could trust my father. As I said, he was an uncomplicated man. It frustrated him when business associates tried to cheat him, since cheating was not in his lexicon. The business he operated with my uncle was small potatoes, employing only 20 men at it's peak. He had a core of men - maybe 10 - who worked for him for more than 20 years. When business expanded he would split up his two-man teams and hire helpers to fill the spots. When it slowed down he would lay off the helpers and re-combine the teams. When work got really slow, which happened from time to time, he would spread what little work there was among his crews so each would be able to make it through the difficult times and feed their families. He ran his business the way he conducted the rest of his life - with great integrity. He trusted everyone until he was given a reason to do otherwise. He stood behind his work and that of his employees and that reputation for reliability and quality kept him in business for those many decades. My father was a m an so revered by his acquaintances and employees that he was referred to by many as "father". That caused confusion from time to time, because strangers overhearing that term of endearment from men his own age assumed he was a priest. He wasn't, of course, but he was a deacon in our church and Scout Master of our Boy Scout troop. He was an honest, hard-working leader of men. My father didn't tell you how to live your life - he gave you the example by the way he lived his. Several of my high school friends worked for my father - some longer than others. A few used their jobs with him as simply a way to earn money during the pursuit of their education. Others made that tough job a career and spent more than 20 years - with smashed and cut fingers, swollen knees and aching backs - lifting those rolls of pad and carpet, moving the heavy furniture in and out of houses and crawling around homes throughout southern California installing floor coverings. 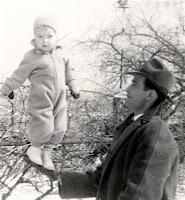 Here's a story that may help illustrate the kind of man my father was. A few years ago - at that time my father had been gone for a decade - a friend and I were having lunch a few blocks from my home at an outdoor eating area when I noticed a fellow and a younger guy sitting about ten yards away, eating and talking. I thought I recognized the older one, and mentioned it to my friend. We sat and talked and ate and, every once in awhile, I'd glance over at those two men and was sure I recognized the older fellow. Finally, as we finished and were about to depart, I excused myself and went over to the table where the two men were also preparing to leave. I walked up and said to the older one, "Excuse me, but can you tell me your name?" He said, "Cliff", to which I said his last name. I had gone to high school with him and his twin brother and he, as luck would have it, was in town from his home in Utah for his daughter's wedding and was having lunch with his son. After a astonished greeting by us both, the next words out of his mouth were, "Your father was the best man I've ever known." Cliff had worked for my father right out of high school, earning money for college. He hated every day as a carpet layer's helper - he felt the job was beneath him - and it used to really make me angry when he complained about it. He eventually quit, completed his education, began working as a civil engineer, got married and started raising a family. I'd lost track of him for more than 25 years. However, life threw him some curve balls, his marriage broke up and the wife moved to Utah with their youngest son. My friend, disenchanted with engineering work, followed along and began working at the trade he learned from my father - installing carpet and vinyl tile for a living. We visited for a couple minutes, then he agreed to join me at my home, where we spent four hours talking about old times. Through it all there was one theme - his admiration for my father and the life-lessons he learned while being around him. This story is only one of many I've heard over the years from men and women who knew and loved my father like he was their very own. When we moved to our present home more than three decades ago I was lucky enough t o inherit a neighbor, Wayne Stanfield, who, although more like an older brother age-wise, conducted himself like a father. In fact, he, too, is referred to by many friends as "father". He, too, is a God-fearing, uncomplicated man who has made his living much like my father did - through honesty, hard work and long hours. When my father died a generation ago, Wayne's presence helped fill that tremendous void. To this day he remains a source of unflagging love and support for me and all his friends and family. He's one of the finest men I've ever known. I'm a very lucky man, because I've had many friends in my life who have helped shape the person I've become. I've had friends and mentors throughout my career who have pounded out a dent here and there and applied a buffer to the rough spots. They've reined me in where necessary and given me my head - to find my own speed - at other times. These are men I've admired, learned from and tried to emulate throughout my life. On this Father's Day, I want to express just how grateful I am for these two special men in my life. I'm grateful for my father, whose example helped form the foundation of who I became for the first half of my life. I'm also grateful for my friend, Wayne, who has participated, through his example, patience, wise counsel and faith, in the constant renovation of my life over the last half of it. One taught me from the very beginning the virtue of honesty, integrity, loyalty and hard work. The other reinforced those virtues and demonstrated, by the way he lives his life every day, that kindness, understanding and love still have a place in our society today. On this holiday I hope each of you fathers out there who might read this will do the very best you can to mold those young lives you've created. A gentle hand and a kind, encouraging word will do more to motivate than a swat on the behind and a threat. Don't tell your children how to conduct themselves - show them by your example. Remember, time is fleeting. If you teach your children kindness and compassion today, perhaps those kids - whose drool you wiped and diapers you changed - will return those favors in the not-too-distant future. What a great piece Uncle Geoff! I knew very little about your father and reading that gave me a glimpse into what kind of man he was. You and your father are very much alike. Happy Father's Day! Happy Father's Day, Geoff. Great tribute, and an honor to your father. Geoff, This was great. I am sure that you would have made a great father. I,m sure your neice,s and nephew,s appreciate you and Sue. You too are kind of the honorary "father" in our neighborhood, always on top of the kids' activities and accomplishments, always generous with your sage advice, and always available and supportive. To say nothing of your ubiquitous camera which documents life in our hood. Happy Father's Day to you, friend! Geoff, what a lovely portrait and as they say the acorn does not fall far from the tree. Thanks for sharing. Joe A.
I wish I had known your Dad. Rather, I wish my Dad and your Dad had known each other. Seems like our lives have way too many parallels. Thank you very much for this posting. To me grandpa was a great grandpa and I loved him. Now I know him as a great man and love him even more. Thank you for the look into his life. By the way, the other comments are right. The apple and the acorn down fall far from the tree. You are the best uncle ever. Thank you and Susie for the wonderful summers and thank YOU for teaching me to drive a stick. I will never forget those times together. Thanks to each of you who posted your kind comments on this entry, and to those who emailed comments directly to me. As many of you know, my father was a wonderful man and my friend, Wayne Stanfield, continues to provide his guidance and love each day. I'm a lucky guy for many reasons and having such caring friends as yourselves is a huge one.